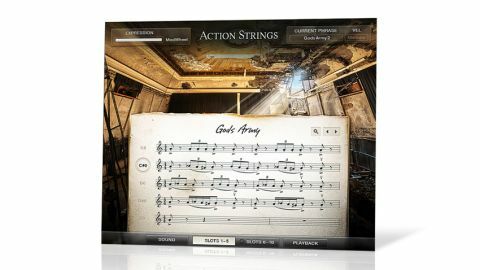 Action Strings is a success, sounding rich, full and intense, and packed with exciting rhythms. Instant gratification. Great string sounds. Of late, there's been a movement in orchestral sample libraries towards 'macro' setups aimed at bypassing the minutiae of programming in favour of instant results, and NI's latest Kontakt/ Kontakt Player extravaganza is perhaps the most boiled-down yet. "Put together using 14GB of recordings of a 16-piece orchestra the Action Strings library comprises 154 phrases"
Put together using 14GB of recordings of a 16-piece orchestra (the FILMharmonic Orchestra Prague, specifically) and produced by top-notch soundtrackers Dynamedion, the Action Strings library comprises 154 phrases, each of which can be loaded individually, or in preset sets of five, called 'Themes'. Assign up to ten of these phrases to the keys C0-A0, and trigger/pitch them with keys C2-C5 - it's as simple as that. Kontakt's timestretch engine keeps everything synced to the host DAW tempo, and switching between phrases can be done so that new ones either retrigger from the start or the current playback position (legato), as you prefer. Playback is polyphonic, of course, and all phrases are presented at two dynamic levels, mixed using the mod wheel. Note velocity switches between major and minor modes for certain phrases, and calls up a staccato one-shot at 126-127. A small processing section offers two Master EQ settings, Dynamics Boost (compression and saturation), a choice of near/far mic positions, and a convolution reverb with a handful of selectable IRs. Again, instant results are the order of the day, so there are no editable parameters for any of these. "We did find ourselves wishing for some level of section mixing, but other than that, it's a really clever system"
The phrases are what the instrument's all about, of course, and thankfully, they're diverse and highly usable. With names like 'Desert Storm', 'The Chase', 'Alien Attack' and 'Fields Of War', it's hard to go wrong, although there are also plenty of monotone rhythms included that can be used to string together less mood-particular patterns. We did find ourselves wishing for some level of section mixing, but other than that, it's a really clever system, and it fully delivers on its promise of making convincing rhythmic orchestral parts an absolute breeze to produce.